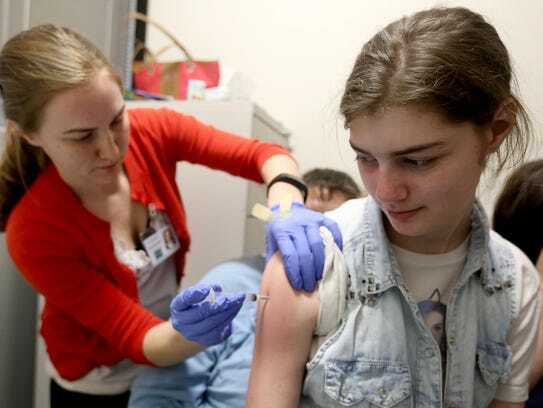 As Oregon Promise bills make progress, budget negotiations still have months to go and bills about vaccination, college mergers and civics appear stalled. Nearly three months into the 2017 session of the Oregon Legislature, senators and representatives have held public hearings and work sessions for dozens of bills concerning education. Vaccinations, state funding, and civics education are only a few of multiple topics broached so far. The deadline for bills to have a work session scheduled or die is April 7. Lawmakers are working to make sure their bills are among those that survive. Meanwhile, more substantive legislation is making its way to the House and Senate floors. Here are some of the education highlights of the session thus far and a look ahead into the remaining months of the session. After a one-year hiatus in the legislature, three bills concerning vaccinations were presented in February this year. Senate Bill 579 addresses consent required before administering vaccinations, Senate Bill 580 would require a written notice of vaccinations, and Senate Bill 687 would clarify the definition “abuse” so that it cannot include refusal to vaccinate or delaying the vaccination of a child. Proponents considered these bills as “necessary steps to protect the rights of parents (and their families),” said Bob Snee, director and legislative policy consultant for Oregonians for Medical Freedom, a coalition that supports parents’ rights to not have their children vaccinated. None of the three bills have made it past public hearings and there are no meetings or floor sessions scheduled at this time. Senate Bill 8, which was presented to the legislature in February, would allow community colleges and public universities to merge into one institution. Oregon Senate President Peter Courtney, D-Salem, who testified at the public hearing on the bill, said the bill would provide more options for students at a lower cost. However, some are hesitant this might actually be harder on students, especially students with lower grades. Senate Bill 8 has not made it past public hearings and there are no meetings or floor sessions scheduled at this time. In February, educators and legislators spoke about the importance of civics education and proposed the state require a certain level of proficiency in the subject for students to graduate high school. If passed, House Bill 2691 would require school districts or public charter schools to only award a high school diploma to a student, at or before grade 12, who completes the requirements identified by the school district. This could include successful completion of a course in civics, a passing grade on a civics test selected by the school district or a passing grade on a civics test developed by the Department of Education and the Secretary of State, according to the bill. The bill has not made it past public hearings and there are no meetings or floor sessions scheduled at this time. More Oregon students are considering and attending college, particularly first-generation students, since the implementation of Oregon Promise. Oregon Promise is a state grant program that covers most tuition at Oregon community colleges. Nearly 6,800 recent high school graduates and students who completed a GED enrolled using the program this year. An estimated 44 percent of Oregon Promise recipients were first-generation college students. More than 19,000 people in the state applied, said Michelle Hodara, the lead researcher on a study about the program by Education Northwest. Currently, the state can only allocate $10 million for the Oregon Promise program per fiscal year during the biennium ending June 30, 2017. If the cap is not removed, proponents of Senate Bill 55 and Senate Bill 1032, both of which amend the cap, said the program will not be able to fund both this year’s students as well as next year’s. Senate Bill 55 has been signed by both the Senate President and the Speaker of the House. It is awaiting a signature from the Governor. The Senate Committee on Education will have a work session on SB 1032 in Hearing Room C at 3 p.m. Tuesday, April 4. Throughout March advocates for boosting education funding from the state have put pressure on the legislature. The current K-12 state budget is $7.4 billion. While proposed budgets for the upcoming biennium — including the co-chairs budget of $7.8 billion, the Governor’s budget of $8 billion, and the Quality Education Model projections of $9.9 billion — would maintain current services for K-12 education, and in some cases expand services, it isn’t clear how much the legislature will approve or exactly how it will be used. The Oregon School Boards Association used poll results to push for more funding. More than 90 percent of Oregonians see K-12 public education as a top funding priority facing the state legislature and more than 60 percent support raising business taxes to avoid cutting school budgets, according to the poll. The state is currently facing a $1.6 billion budget shortfall for the 2017-19 biennium. Senate Republicans also sponsored an “Education First” package, consisting of two joint resolutions. Senate Joint Resolutions 18 and 20 seek to prioritize education funding in the state budget and hold elected officials accountable for the expediency of the budget. Neither of the joint resolutions has moved past public hearings and there are no meetings or floor sessions scheduled at this time. Additionally, educators, students, and other advocates used this week as the perfect time to visit the Capitol to talk about state funding. Oregon Education Association representatives and supporters talked about large class sizes, staff cuts and the lack of resources for students due to funding on Monday, March 27, the first official day of spring break. The legislature has to have a balanced budget passed by June 30. *This is supposed to maintain current levels of teachers and programs. SB 20: Updates references to federal education law to reflect the passage of Every Student Succeeds Act. SB 55, SB 1032: Amends Oregon Promise program to remove the prohibition on awarding more than $10 million in grants per fiscal year. SB 138: Requires Department of Education and Higher Education Coordinating Commission to establish career and technical education pathways. SB 207: Requires each public university and community college to provide credit to students who receive certain grades on advanced placement examinations. SB 318: Directs Department of Education to provide technical assistance and support to school districts and community colleges to prevent and respond to interpersonal violence. SB 351: Directs Secretary of State to conduct an audit on the use of statewide summative assessment in public schools in this state. SB 414: Directs Department of Education to establish school-based student threat assessment system to support school personnel in conducting threat assessments of students who are at risk of engaging in violence or destructive behavior or committing self-harm or suicide. SB 439, SB 565, SB 595: Creates credit against income taxes for amounts paid as interest on qualified education loans. HB 2229: Requires school districts to offer instruction in financial literacy. HB 2530: Prescribes requirements for guidance counselors in schools. HB 2651: Includes school class size as mandatory collective bargaining subject. HB 2845: Directs Department of Education to convene an advisory group to develop statewide ethnic studies standards for adoption into existing statewide social studies standards for public kindergarten through grade 12. HB 3015: Allows school district and public charter school to implement nationally recognized high school assessments in mathematics, science or English if assessment complies with specified criteria. HB 3029: Increases compulsory school age from six to seven years of age. HJR 28: Proposes amendment to Oregon Constitution to require Legislative Assembly, in each odd-numbered year regular session, to appropriate money to fund public education before passing any other budget bill.